We offer Snow Tire Changeouts & Free Estimates! To recommend the services, repairs and maintenance to the car owners that are necessary to maintain the vehicle in safe working order. To use only products which are safe and provide service that equals or exceeds that recommended by the vehicle's manufacturer. To service and repair the vehicles in a timely manner and to keep the customer informed of any and all changes including completion times. To give the best customer service possible and, in the case of any disputes, to provide a prompt and amicable resolution. To ensure that my entire staff conducts themselves in a professional manner and in keeping with the high standards of the automotive industry. Great service. Always there when I need them. Very knowledgeable. Excellent business run by honest and hard working people. They get the job done! Excellent service. They always try and get you out of there spending the least amount possible, without sacrificing quality. 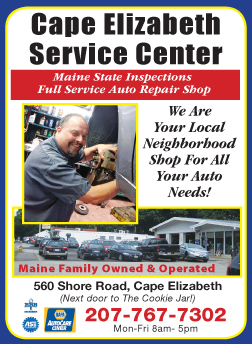 I've been going to Ray (Cape Elizabeth Service Center) for years, same as my parents. When our old truck couldn't be on the road anymore due to its age, we bought our new truck at the Service Center. Happy Customer! Most honest thorough repair shop. Ray and crew are the best there is.The only place I trust to repair my vehicles. A small town station that gives fantastic service! Love this place! Ray and his crew provide top notch service at a fair price. Wouldn't go anywhere else!